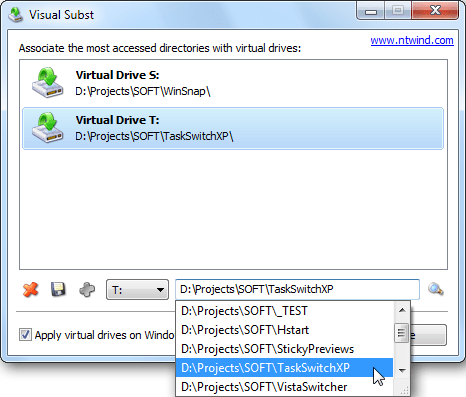 Visual Subst allows you to associate the most accessed directories with virtual drives. It uses the same API like the console subst utility, but makes it easier to create and remove virtual drives with a friendly user interface. Visual Subst can also restore the virtual drives at startup. NOTE: Program became shareware, linking to Archive.org for the last freeware version. How to extract: Download the ZIP package and extract a folder of your choice. Launch VSubst.exe. Fixed an error message if drive letter is used by another program.